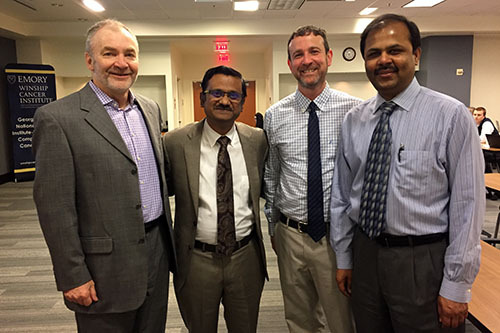 From left to right: Walter J. Curran, Jr., MD, Krishnendu Roy, PhD, Adam Marcus, PhD, and Suresh Ramalingam, MD. Co-chaired by Suresh Ramalingam, MD, Kimberly Kerstann, PhD, and Adam Marcus, PhD, the Winship Scientific Symposium on February 16 highlighted outstanding cancer research from Winship faculty, staff, trainees, and students. An opening night reception and poster session was held February 15 in Emory's Miller-Ward Alumni House. Congratulations to all the poster session participants, including the top-scoring poster presenters who were selected to receive awards and cash prizes. 1st Prize: Emily Summerbell – "Leader cells are defined by DNA hypermethylation and aberrant gene expression during collective lung cancer invasion"
2nd Prize: Priya Kapoor, PhD – "The histone methyltransferase Suv420h2 prevents the epithelial-to-mesenchymal transition (EMT) by restraining the mesenchymal program in luminal breast cancer cells"
2nd Prize: James Ross – "The Role of Tumor Associated Macrophages in Pediatric High Grade Glioma"
1st Prize: Mohammad Zaidi, MD, MS – "Defining the Number of Lymph Nodes Needed to Accurately Stage Small Bowel Neuroendocrine Tumors: An 8-Institution Study from the US Neuroendocrine Tumor Study Group"
1st Prize: Doratha Byrd, MPH – "Associations of whole food and lifestyle-based inflammation scores with incident, sporadic colorectal adenoma"
2nd Prize : Andrew Ritter – "Overall Survival Disparities in Metro/Urban/Rural Diffuse Large B-Cell Lymphoma Patients"